INCREDIBLE! 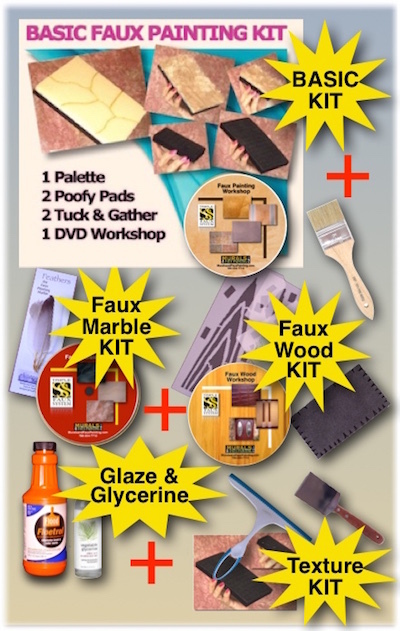 You get the Basic, Marble, Wood and Texture kits in this faux painting combo set with FREE Priority Shipping AND a FREE Faux Painting Color Suggestions E-Book plus a FREE Faux Wood Color Formula e-file . Now WITH MORE PAINT AND GLYCERINE! HURRY - FOR A LIMITED TIME ONLY! DVD that teaches you 7 differnet types of marble - Workshop includes tips and practice sessions. DVD that teaches you how to achieve a faux wood finish on garage doors, cabinets and more- Workshop includes tips and practice sessions. Unique tool to add grain lines with 8 different sides! * 6 bottles (7.2 oz. each) of LOW VOC VALSPAR Paint samples - Florentine Brass, Latte, Burnt Wine, Black Brown, Fox Fire and Shade Grown. We have bottled 6 of the most popular paint colors for faux painting. The colors we have used for the Old World Parchment and Color Washing are included. Each bottle is VALSPAR PAINT - to mix enough glaze to faux paint an entire living room and small bedroom (11X11). We sell EnviroSafe paints (ZERO VOC) in quarts if you want to have them drop shipped to your home or you can buy a similar color from any paint store. The colors are named on the FREE Color Suggestions Idea E-Book that is included. Now you can add texture to your walls by hand with this tool set. This set alone costs $14.99. More information about these tools. Floetrol is a paint conditioner that we use as a glaze. It can be mixed with regular wall paint as well as acrylic craft bottled paint. One quart will allow you to faux paint an entire small bedroom (10 X 10) or bathroom. This size is great for practicing your techniques. You can purchase a gallon later from Home Depot or Lowes for larger projects. You should get your package 2-3 days after it is shipped.